Many fish are considered healthy these days but everyone has their own favorites and types they won’t eat. I recently wrote about how I’m enjoying walleye these days but my wife didn’t like the flavor. 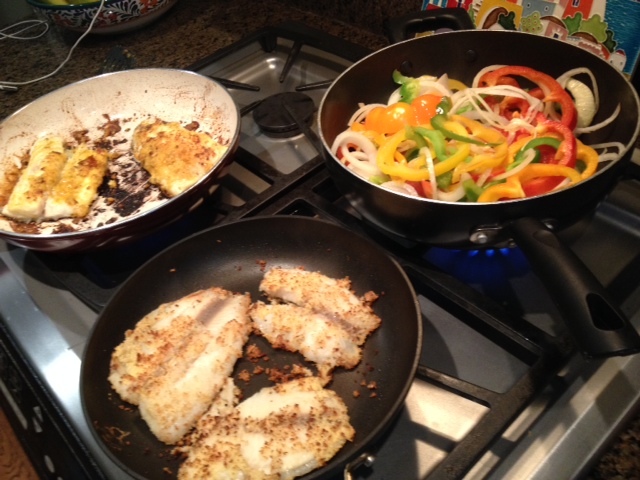 So one recent Friday, I did a fish mix and match dinner, making walleye for me and tilapia for her. My mix and match fish dinner cooking away, walleye in the white pan, tilapia in the black with peppers and onions in the third. The side dish of peppers and onions, cooked down on the stove until the onions go limp and get slightly sweet, and the peppers, cut into strips, become soft, goes wonderfully with any fish. It was a wonderful mix and match dinner. Try several types of fish for a dinner for family and or friends and let them sample some of each. You’ll be eating low-salt, low-fat, and hopefully enjoying it too.